Agate is essentially a Quartz (Silicon and Oxygen) - but it is microcrystalline (doesn't form into Crystals) - and features wavy banded (and sometimes quite colorful) layers, due to the deposit of the component elements in pockets of igneous rock. As such - it provides more of a visual than metaphysical experience, per se - but partakes of the "Hallucinogens" (my name) - which are evocative to the imagination, due to their rich and varied patterns. In other words, on top of being beautiful, they are also inspiring, creatively. Many Agates are dyed, and the trained eye can identify which are not natural, generally untreated Agates have more muted colors. You can tell a red Agate from a Carnelian, because the former has clear layers, and the latter's more amorphous (almost biological) in its formation. Agate is also the matrix out of which most Amethyst grows, so you often find under Amethyst crystal clusters, including Blue Lace Agate. 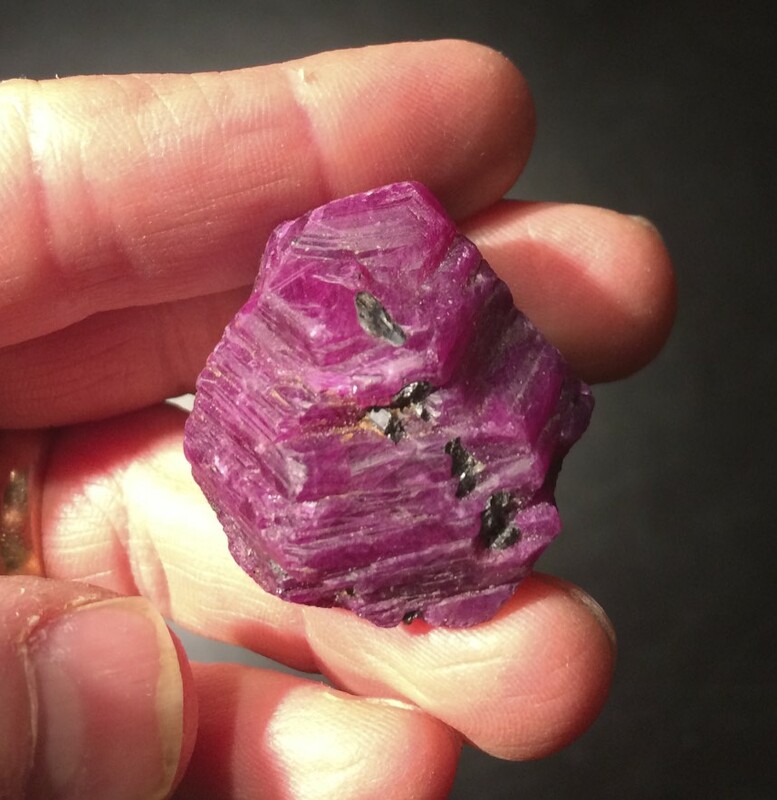 To learn more about - and purchase this or other types of stones - please email Kyle@CrystalConcentrics.com. 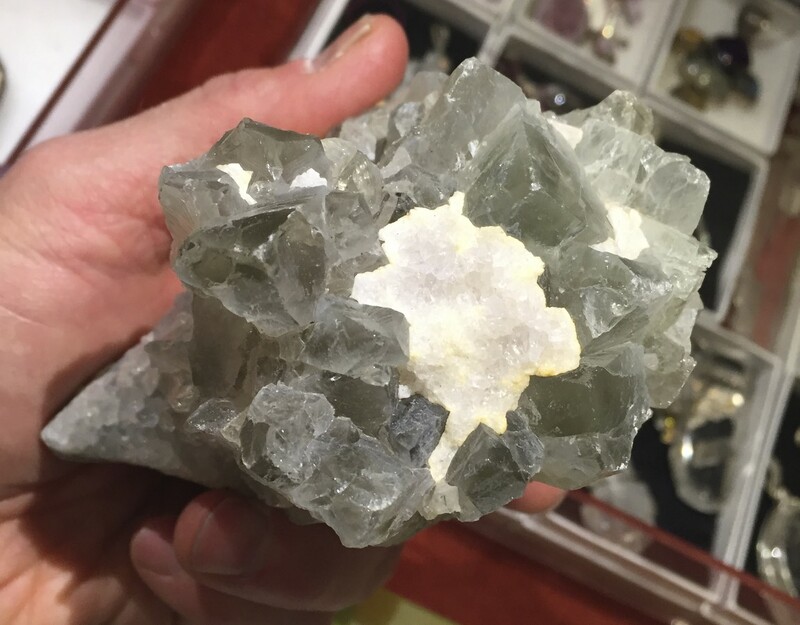 Apophyllite is softer (and way more fragile) than Quartz, but as such, it can "go higher" or it IS higher, I call it the Astral Stone (because it takes you there). Imagine getting to the 13th (or higher) floor without having to use the stairs or elevator. That's Apophyllite. Email Kyle@CrystalConcentrics.com to learn about (or purchase) this type, or other varieties of Crystals. 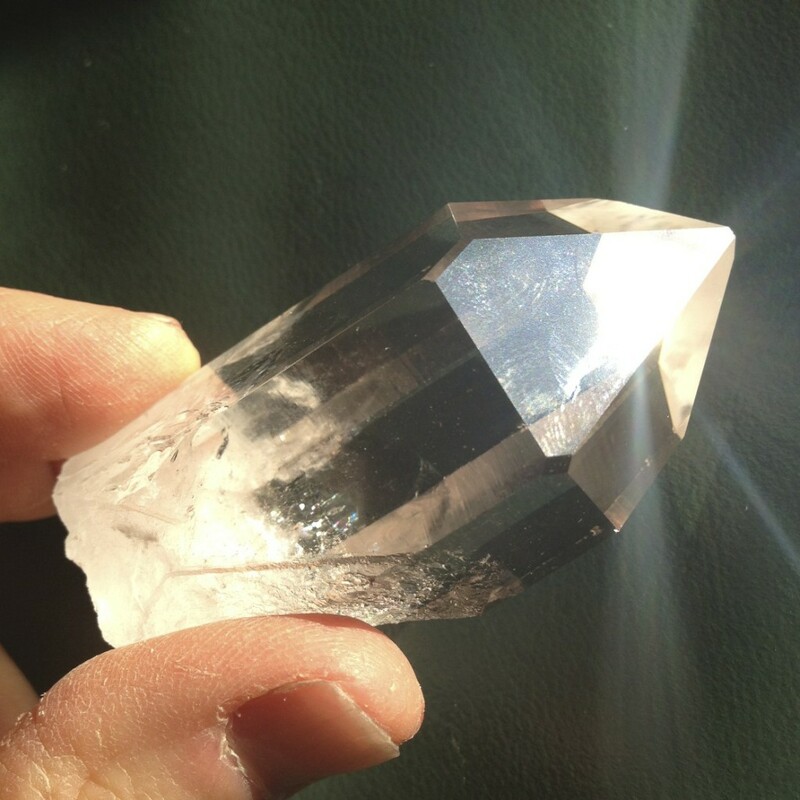 Check our Apophyllite section for a definition of clear Apophyllite simply as "the Astral Stone." In this case, "we" are green - as a result of a different chemical makeup - producing distinctive crystallizations, as you'll see from the specific individual crystals featured in this section. Be sure to read each of their descriptions. Now green Apophyllite resembles green Fluorite - the Spirit Community Stone - but it interesting because it's less personal, or subjective, and more universal in its energy. It bridges the Spirit World with the Astral Plane. 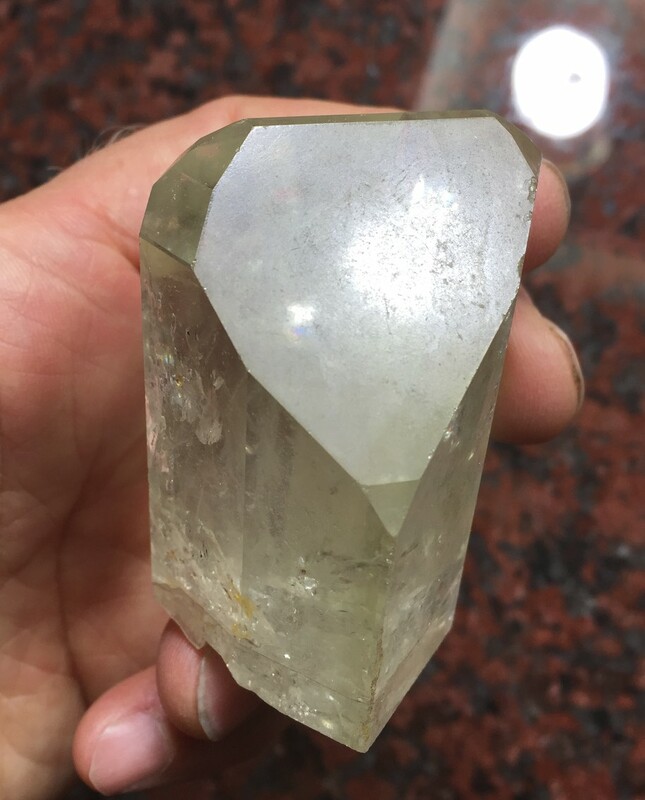 I imagine it would be logical for a Psychic to use clear Apophyllite, but for a Medium (connecting with "the other side"), green Apophyllite might be very appropriate. Pictured are several forms - the rarest is the fine tapered termination cluster - and the most fragile is the standard, small cubic formation. The massive green cubic crystals are the hardest, and have large textured surfaces, oddly grounding by comparison with the others. 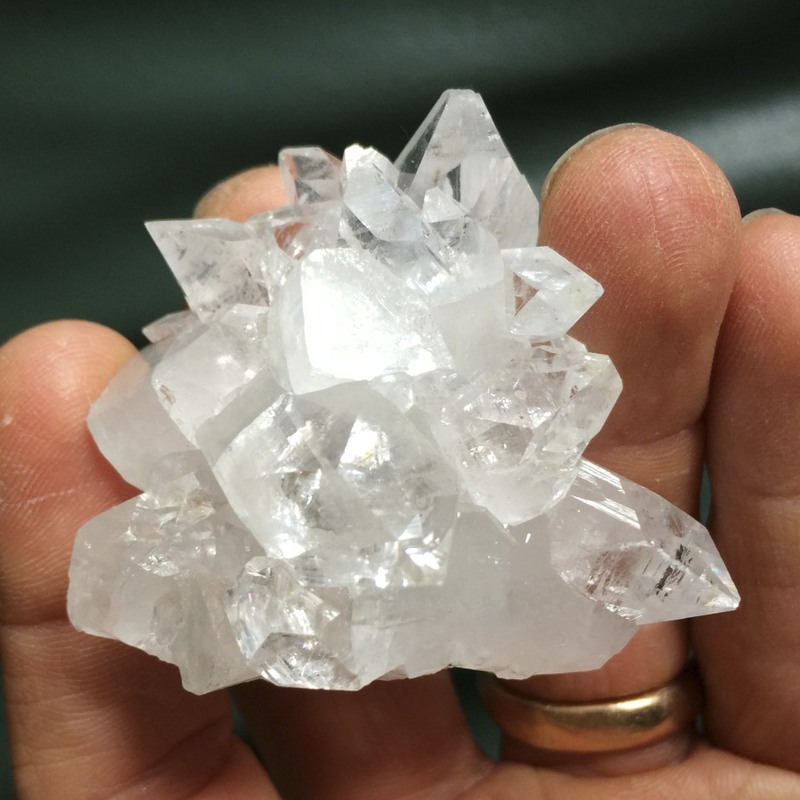 Email Kyle@CrystalConcentrics.com to find out more about this and other Crystals - including our MANY items For Sale - looking forward to hearing from you! When many points (or terminations) are taken together, in a cluster formation, they take on a different energy than when separated. Together, they emanate (upwards) a spiritually cleansing "mist," ideal for clearing items, a room, or anything above (and often around) them. 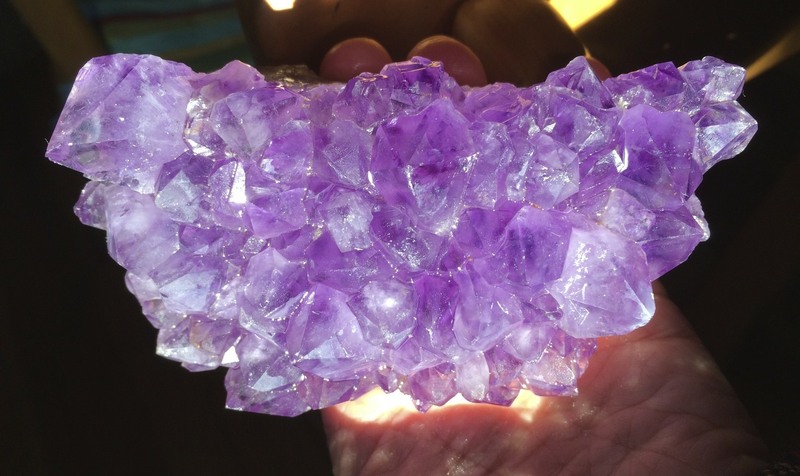 Amethyst clusters differently, in different parts of the world - Brazil is where they most commonly come from - though Uruguay has been producing a lot of smaller & darker crystal'ed clusters in recent years. 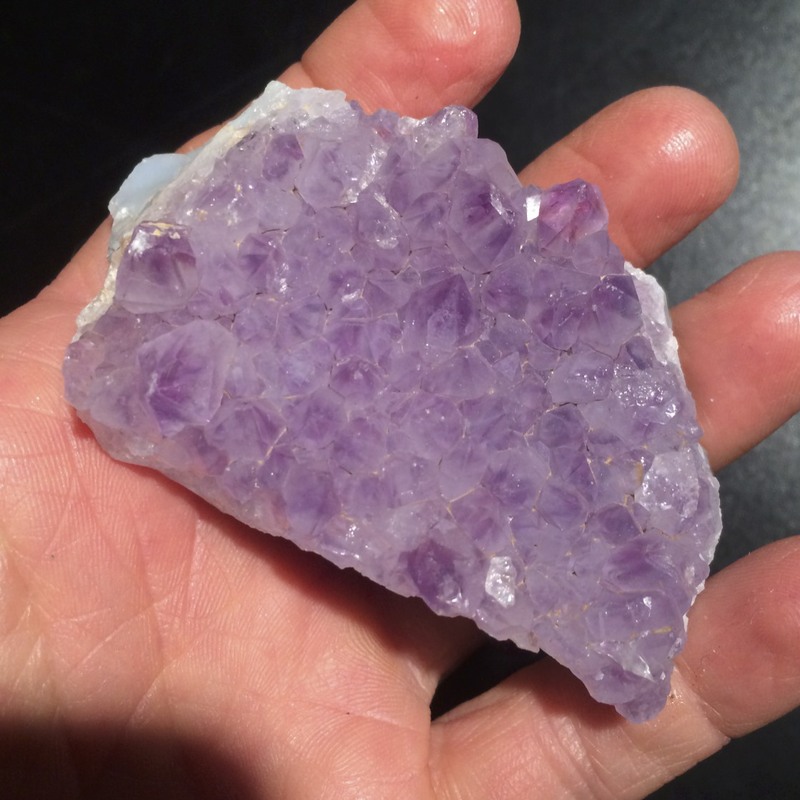 India has Amethyst, as does the U.S. (though American - and Tibetan - Amethyst is often of the Elestial Smoky variety). Madagascar has wonderfully colored material, from off the southwestern coast of Africa. Email Kyle@CrystalConcentrics.com with interest in these or other Crystals, whether it's more you'd like to learn, or whether you're interested in purchasing them. Representing Spiritual Mission - Amethyst is among the most regal of Crystals - inspiring us to fulfill our own highest purpose. 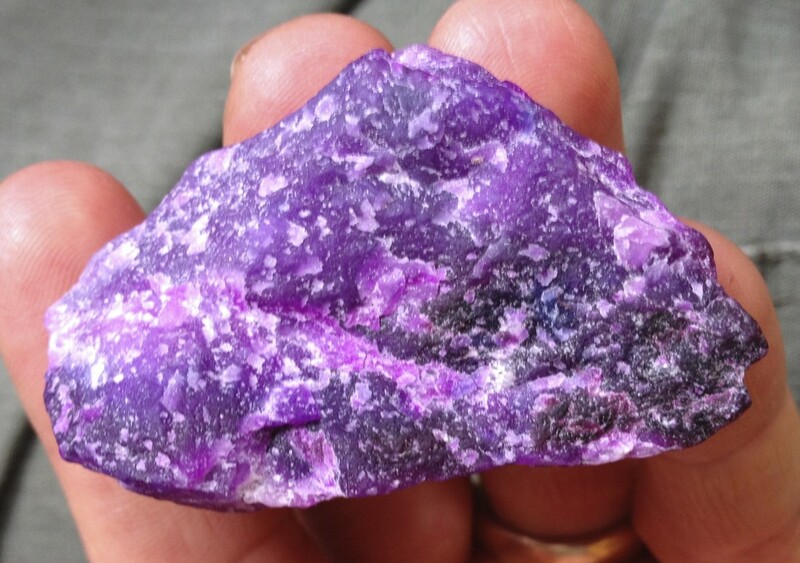 This energy is found in what I call the "perfect purple" of a gem quality cut/polished piece or point. That purple is dark, translucent, and uniform. Often points have lighter, white or milky "roots" or bases, which brings in that softer, nurturing energy of Milky Quartz. Chrysocolla combines Malachite (the green) for emotional expressiveness and Turquoise (blue) for humility, but together they spell self-compassion and stepping light, particularly with regard to self-judgement. This stone (and its qualities) cannot be underestimated for its impact (and implications) regarding self-care. It is about the inwardly-oriented voice: how do you speak to yourself? 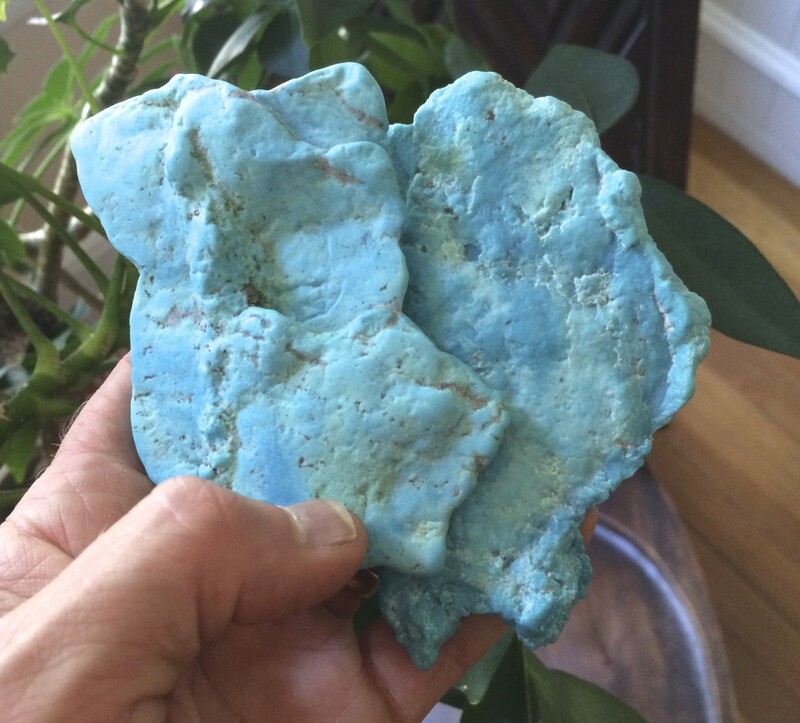 Chrysocolla is like a counterbalance for the more outwardly oriented Lapis. To be a complete person, it's not just all about how you project and achieve "out there" - but how you take care of yourself - what you project and how you receive within and towards yourself. If you're interested in buying Chrysocolla, or have any questions, please don't hesitate to write me: Kyle@CrystalConcentrics.com. Citrine is the most obvious (but not the only) gateway into the Solar Plexus, which is at the top of what I call Foundation, the Energy Zone including the first 3 primary Chakras (Root, Belly, and Solar Plexus). As a translucent, it has to do with Spirit, and represents the Positive Ego (your Best Self). You want to use Citrine when you're trying to "get back to you," or your own better self. It's very pure and incorruptible. Clear Quartz is everywhere (relatively common), though most often not clear as day, and water, unless it's crystallized. It represents focus and clarity, and those are good things. But there is also coolness - an almost icy quality that can sometimes come from clear Quartz - which can be zingy and uncomfortable to some. 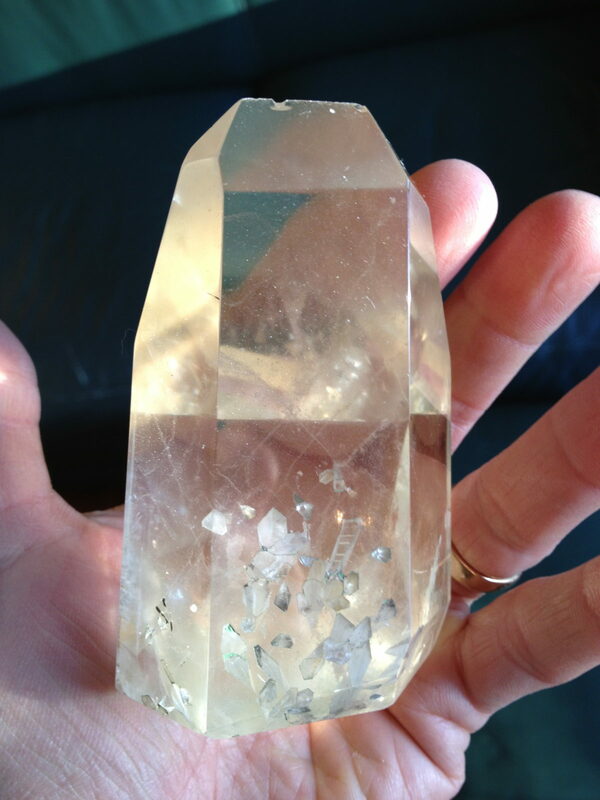 Intention means much when it comes to working with clear Quartz. It transmits what you're sending - but not perfectly (as does Selenite) - Quartz pieces each have their own personality (not an identity, per se, but certainly a unique way of filtering energy. Differences in origin and structure are meaningful. Click through the pictured specimens and read their descriptions - to learn more about each - and the special domain they cover, individually. Hematite took awhile for me to "understand it." Yes, I always have know it's good for grounding...it's heavy! Gravity's pulling it towards the center of the earth, that would be a perfect quality for something you want to be grounding you. However, it's metallic - and is not the ultimate grounder in the stone world - I give that title to the more 100% rock: Ruby. 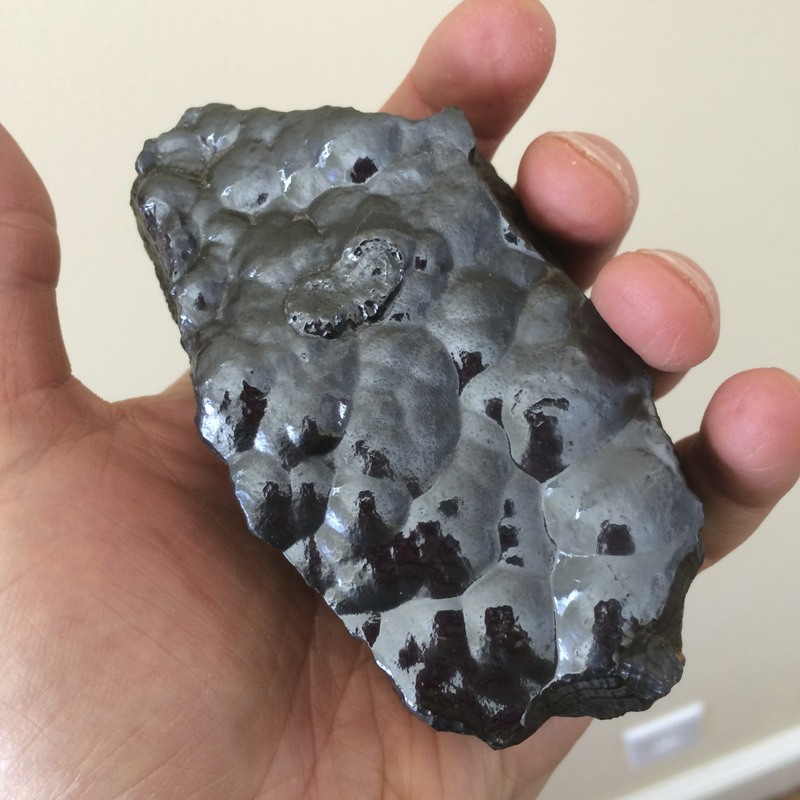 However, as a metallic, Hematite has something different it brings to the table - electronic connectivity - and as such, it can tie us into the universal. That's a powerful combination: groundedness and connectedness. 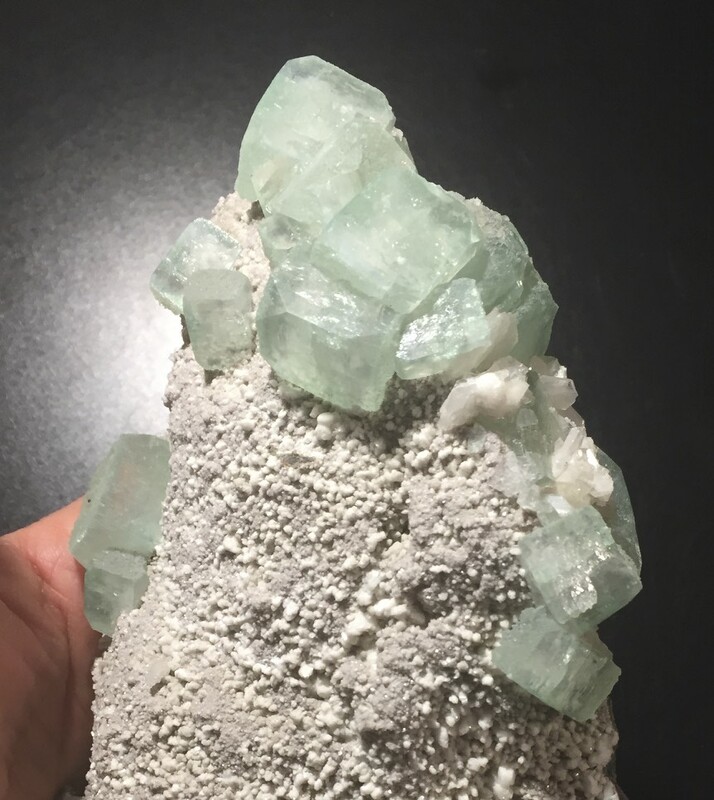 If you'd like to learn more about this or other Crystals - maybe you'd like to purchase from our find inventory, or join our mailing list - also write Kyle@CrystalConcentrics.com. 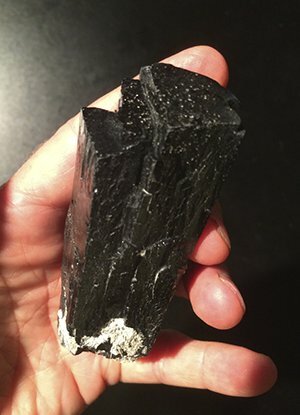 Ilvaite (that first letter is an "i") is akin to Black Tourmaline - and "out-of-the-box," it's a more powerful version of it - also much more rare (and expensive). It has a distinctive bowing termination, and is often tighter in formation than Tourmaline (ie. not ever flaky, as can be the latter). It's associated also (as is Black Tourmaline) with boundaries, but it's more proactive in setting limits...can be used more as a wand (projecting energy) rather than more static, in simply defining space. 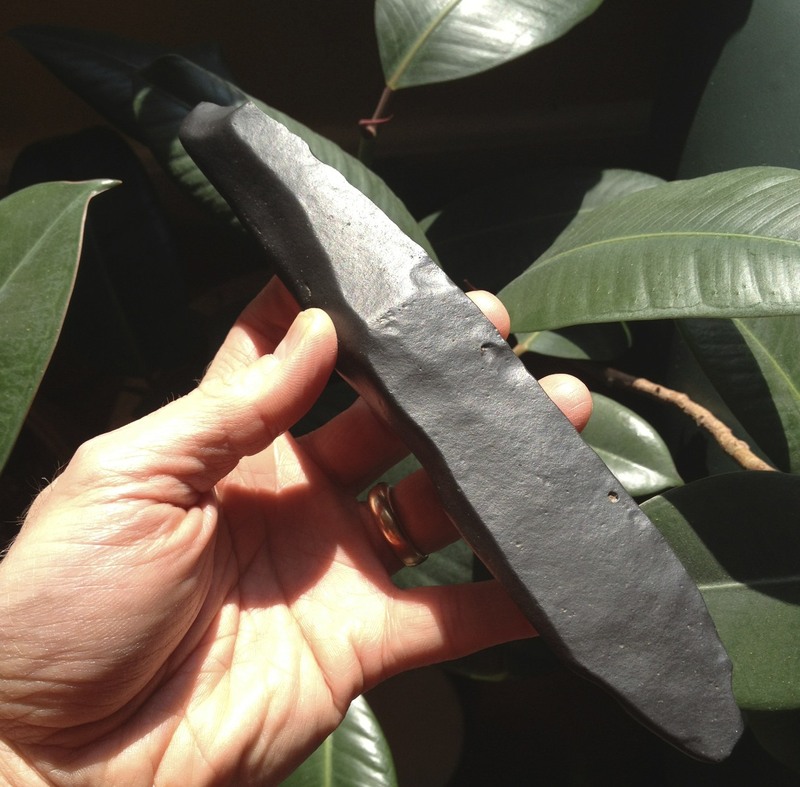 Email Kyle@CrystalConcentrics.com for more info, or to purchase this (or any type of) Power Stone Crystals. Also called Crocodile Jasper - Kambaba Jasper hails from Madagascar - and is akin to Malachite (an emotive, that brings out feelings)...just less intensely colored, and with a different strain, energetically...specifically deriving from the patterns on its surface (which make it somewhat of an "entity stone"). Often you'll see evocative, being-like shapes and patterns on a Kambaba Jasper, that make you wonder "who's living there." Technically, this stone is a Stromatolite - which is a fossilization of algae that grew over itself, generation after generation - leaving mineral deposits that later turned to stone. If you'd like to purchase some Kambaba Jasper - email Kyle@CrystalConcentrics.com - I specialize in custom mail order, and would be happy to put together a package of interesting stones for you! Labradorite is a "gateway" stone into the Subconscious. It catches the light with wonderful iridescence, and comes in a variety of forms. 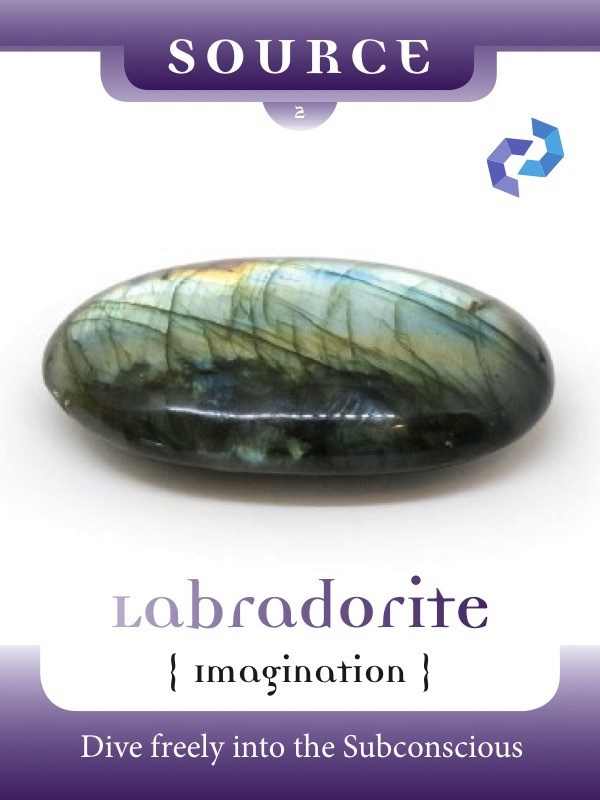 Labradorite is also all about the Imagination, alludes to the Dream Time, and of course: Creativity. As such, I group it with the stones I call "Hallucinogens," because of their capacity to stimulate the mind, but in a non-harmful way. Most of the Labradorite on the market (all that I've seen) originates from Madagascar. However, Spectrolite - which is virtually identical (for our purposes) - hails from Finland. I have some of it, and can't really tell the difference between them. If you'd like to learn more about this or other Crystals - including to pursue any interest in purchasing some - please email me: Kyle@CrystalConcentrics.com. Lapis is the epicenter (or axis) of the Throat Chakra - or Human/Crystal Energy Zone - which I call Voice. It is the strongest of the stones connected thereto - in the sense that it is dominant - but it does not replace, nor should it be construed as being "more important" than the others. Other Voice stones include Chrysocolla, Turquoise, Kyanite, and Sodalite. 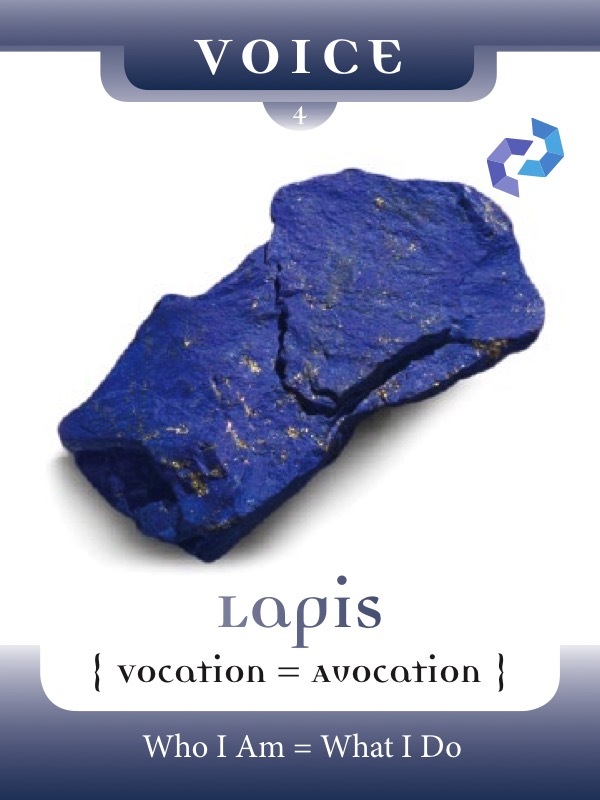 The latter is a lesser version of Lapis, in other words it evokes Lapis energy, but is less potent (and also less expensive). I explain these other varieties on other parts of this site, or you can write me for more information about them. Back to Lapis! It speaks to the primary purpose and expression of our vocation (job) or avocation (dream job, or passion). Per the card from my Crystal Meditation & Affirmations deck (featured image), you ideally want 'what you do' and 'who you are' to be aligned, or one and the same. Alas, this isn't possible for all of us, and is also a challenge for those who think of themselves as being on the right path towards achieving that complementarity. Structurally, Lapis is made up of 3 primary 'ingredients' - Lazurite (the blue), Pyrite (the gold), and Calcite (the white) - and is generally valued more highly when there is more blue and gold present than white. Unlike darker points or clusters, lavender Amethyst has its own function as a natural Spiritual healer, with a very soft and gentle energy. A key Heart Stone - Malachite combines the openness of Black, with the Green of the heart - and is what I call "an emotive" (allowing you to access and express feelings). Often unhappiness is the most difficult emotion to explore, but Malachite goes right there, without apology. If you (or a client) need to "get to the point" - cut to the core of the matter - this is a useful tool for getting there. Geographically, nearly all Malachite comes from Congo and/or Africa. Some comes from Russia, but I don't know that I've seen that. All the Malachite pictured is from the traditional sources. 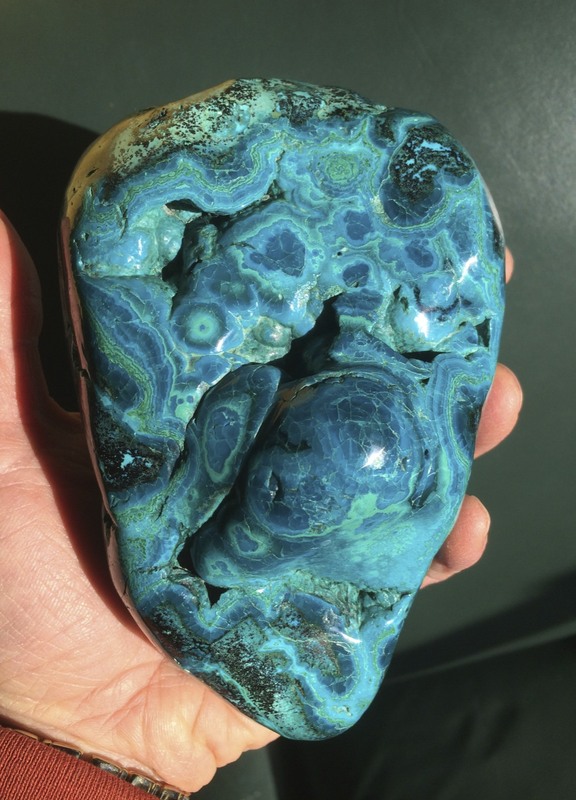 Click through to get specific descriptions of each - they range from the standard "botryoidal" (bubbly) formation to what I call "satin Malachite" and even "amorphous pattern" and very dark (the deepest) Malachite. 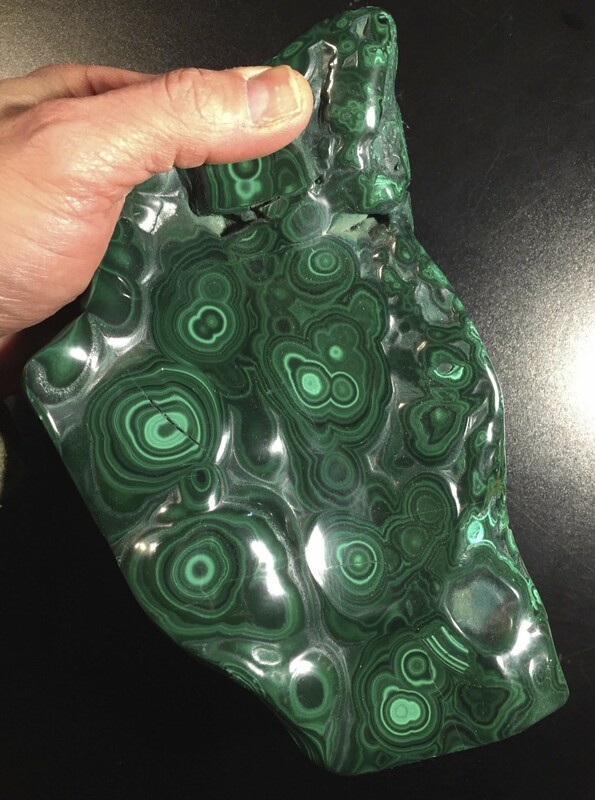 To purchase Malachite, learn more, or inquire generally about Crystals...please email Kyle@CrystalConcentrics.com...thanks! 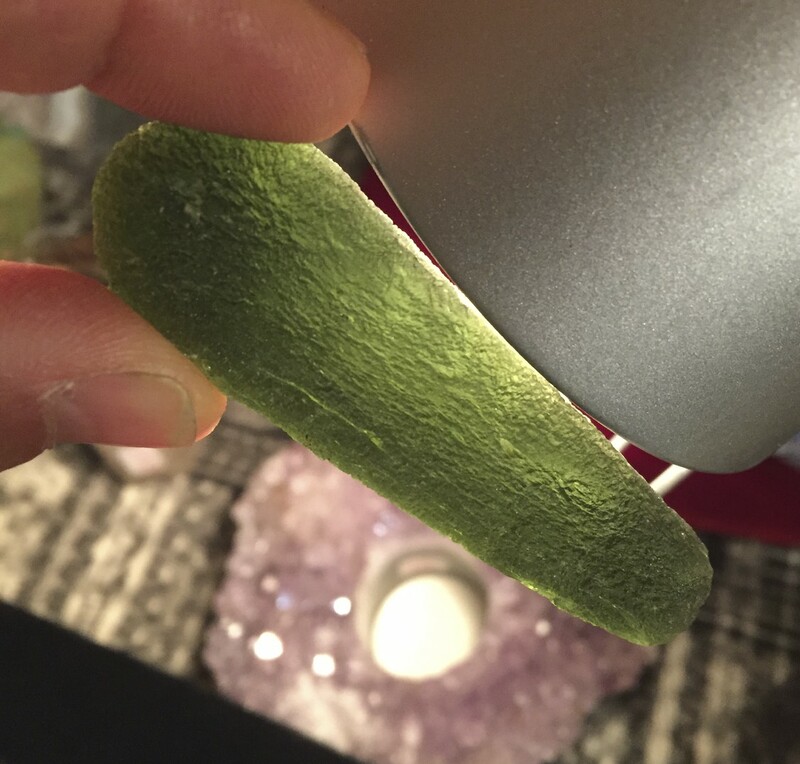 Moldavite is legendary, with "cult classic" appeal. MANY people report supernatural experiences associated with it, including myself! In fact, receiving one free, from a legendary figure in the Crystal business catapulted me into my entire Crystal experience (with major informational downloads being felt to this day, 30 years later). I call it "the alien stone" because of it's connection (as felt by me and others). This can be very ungrounding, and in fact my own experience was so intense that I eschewed (stayed away from) it for 20 years, till I was "ready" to be around it again. Because of the extraordinary connective potential of this stone, I warn people to be careful of it. But unlike some stone varieties, all of which tend to be the same (linear Selenite is an example) - not all Moldavites are the same - just because they're Moldavites. As I explain, it's like a box of cell phones - one might reach the corner pizza store - and the other a denizen of a faraway galaxy. 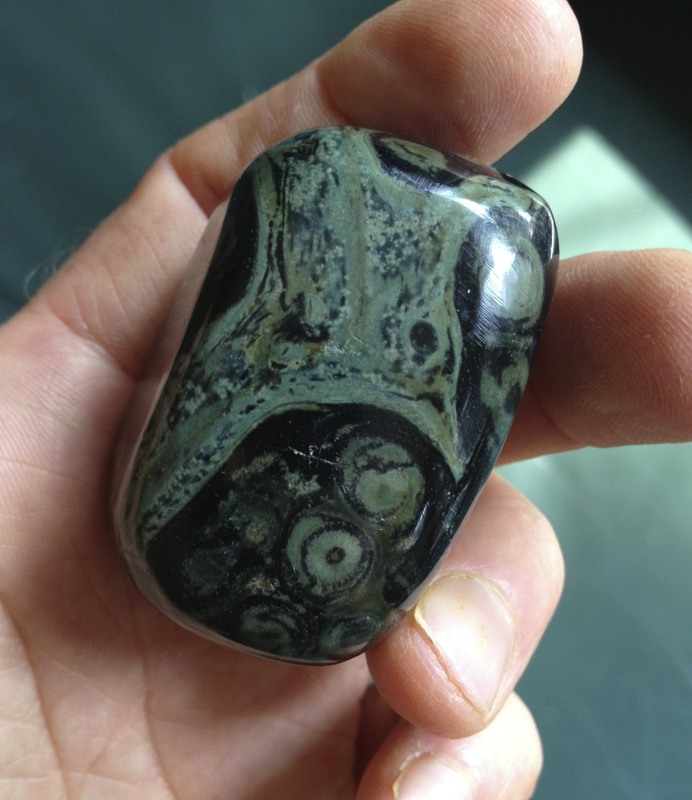 I'll be explaining more about the geological history of these uniquely gem quality tektites (composite material blending earth and alien elements) soon, but if you'd like to learn more or be in touch, including with interest in purchasing exceptional Moldavites, email me: Kyle@PortalCrystalGallery.com. Be sure to read this whole description - and click through to each photo - as they all have blurbs particularly explaining the different varieties (and why they matter). 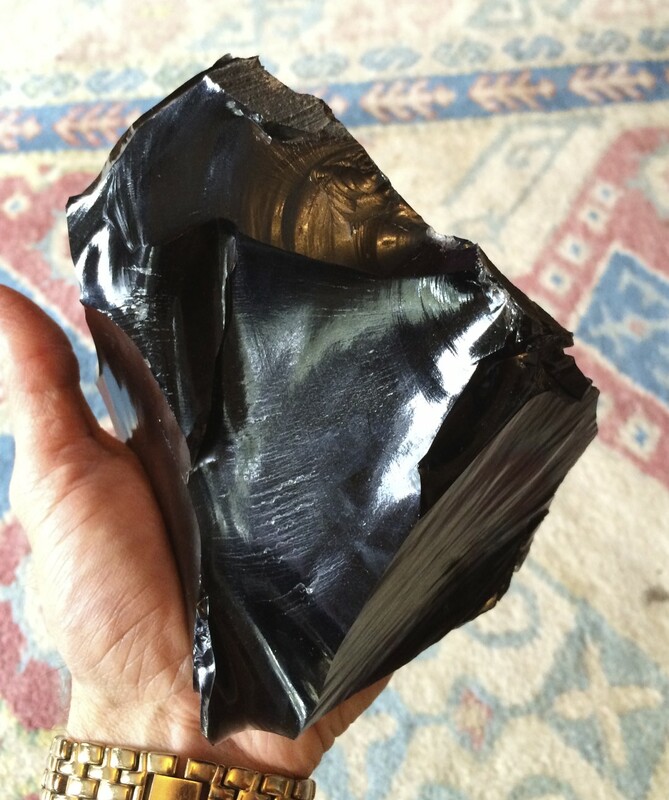 Additional varieties notwithstanding - I consider the elemental Obsidian to be Black Obsidian - a pure, uniformly colored volcanic glass (it comes out of the ground, molten!). It symbolizes Clear Openness, "the Black before (and between) Creation," and even The Void (Outer Space, etc.). It's not meant to be scary or death-oriented - or even capable of "housing" evil - it's simply a blackboard...blank, unwritten on...full of potential and possibility. You can use is for general clearing, space clearing, "holding-the-space" in ritual, opening you up to opportunities. And there's more! Remember to click through each photo, and read its description. Actually, at first you'll just see the photos. There's a little icon in the lower right of the screen with 9 little squares...click on that to who the text beneath each image...Kyle@CrystalConcentrics.com with any issues - to learn more - or to purchase some Obsidian, please email me. Opal partakes of "the Iridescents" - the group of stones that includes Labradorite - and plays (in a multicolored way) with color. That necessarily involves it with the Imagination, Dream Time, the Subconscious. That scares people - 'cause they can't "nail it down" and compartmentalize it - leading some to think it's connected to bad luck (people often fear what they don't understand). I disagree - I don't have an issue with any of the Opals. White Opal I think has to do with real fortitude: strength - a bit like the Herkimer Diamond. 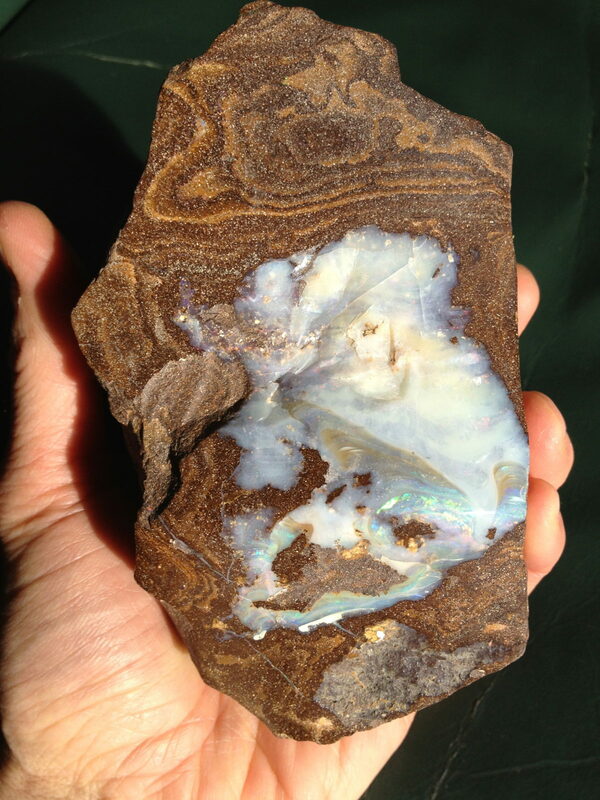 However, there are many other types of Opal - and as if often the case with stones - each piece and each type has its own energy. Particularly with the Opals, that means each can be dramatically different from the others. I'll only be picturing ones I've owned, so you won't see every variety here. Opals without light play are Green and Pink Opal, from Madagascar and Peru, respectively. They have totally different feels. I'll get into that on the individual image descriptions. Prasiolite is one of those rare green quartzes that crystallize. From their shape, you can see they follow the same habit (or formation) as Amethyst. The specimen I've chosen to represent the genre is also quite distinctive because unlike most quartz, it forms a point with only 3 facets (not 6), creating in this case a pyramidal (or trigonic) termination. In any case, I've given Prasiolite the distinction of being associated with Assension. It's very high in vibration - and though green, hails not from the Heart Chakra - but rather from Source, where green Fluorite "resides." The idea is that this material "takes you there" - or it's a window - a channel or tidal undertow that can draw you up there if you let it. 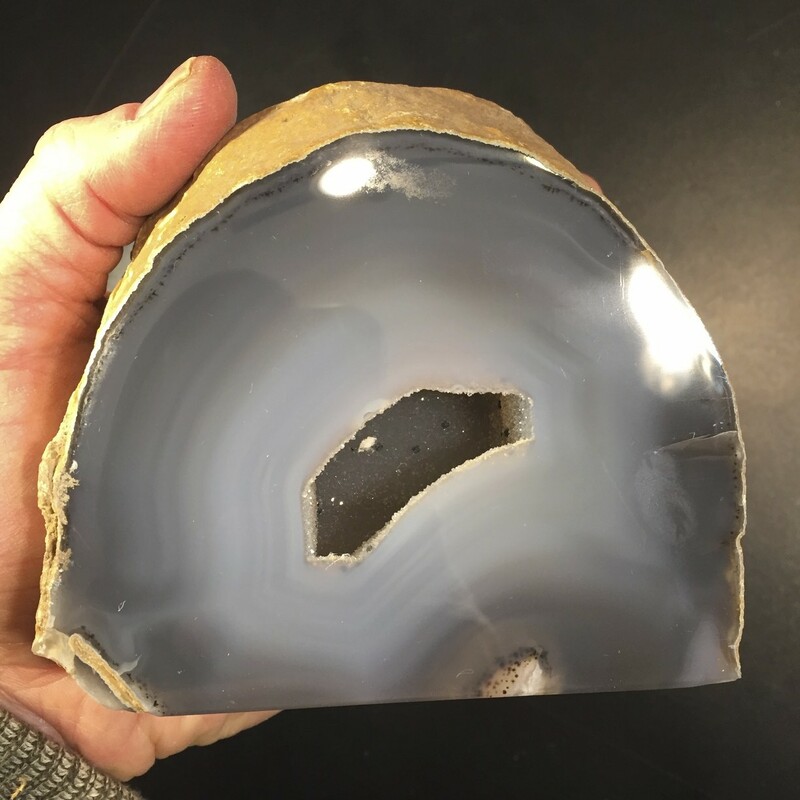 Find out more by emailing Kyle@CrystalConcentrics.com, we buy and sell stones, and would be happy to put together a custom order of Power Stones for you. Truth be told, though - most Prasiolite is cut faceted (and treated) material - so the rough authentic stuff like this is few and far between. 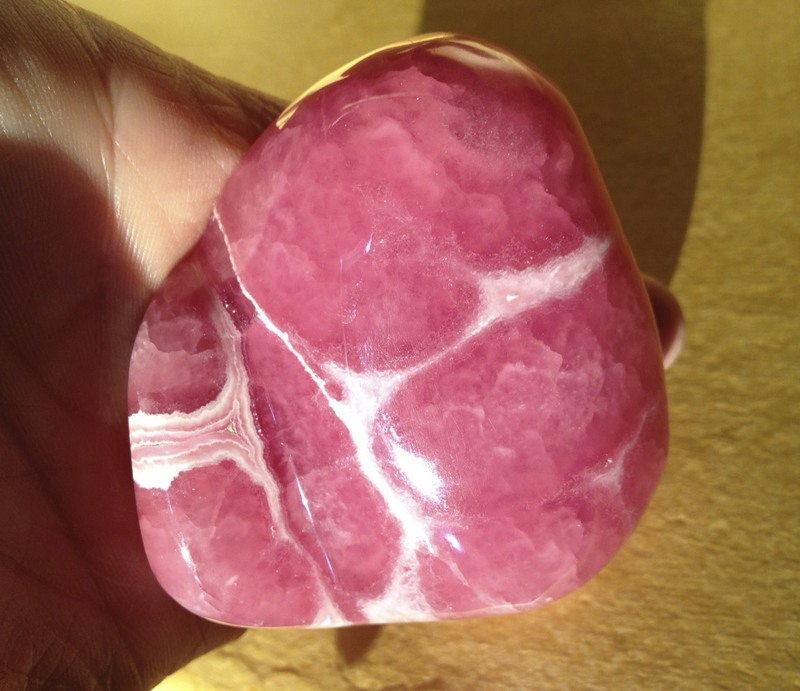 Rhodochrosite is one of my favorite Root Chakra stones - it represents Cellular Vitality and Regeneration - visibly looking like healthy flesh/tissue. The more vibrant it appears, the more energetic "umph" it has, though beyond it's classically rich red color (as you can see in the featured specimen) it can get to a transparent (even redder) transparent gel color (which is wonderful, from Peru, but not necessarily more powerful). Ultimately, Rhodochrosite is used as a Healing Stone, specifically for and from the Root, and is "designed" to help us restore physical functionality, as much as is possible. As it gets lighter (there's another, lesser variety from Peru) - or in the case of the completely different stone: Rhodonite - it's like Rhodochrosite "Lite" (much cheaper, but also less potent). Notice the "botryoidal" (or bubbly) formation, you'll also see curvaceous layering. White and black are often visible, as well as (sometimes) brown, which is Aragonite (and very nice energetically, quite soft, as well). Rhodochrosite often forms in concentric stalactites that are cut into sections. 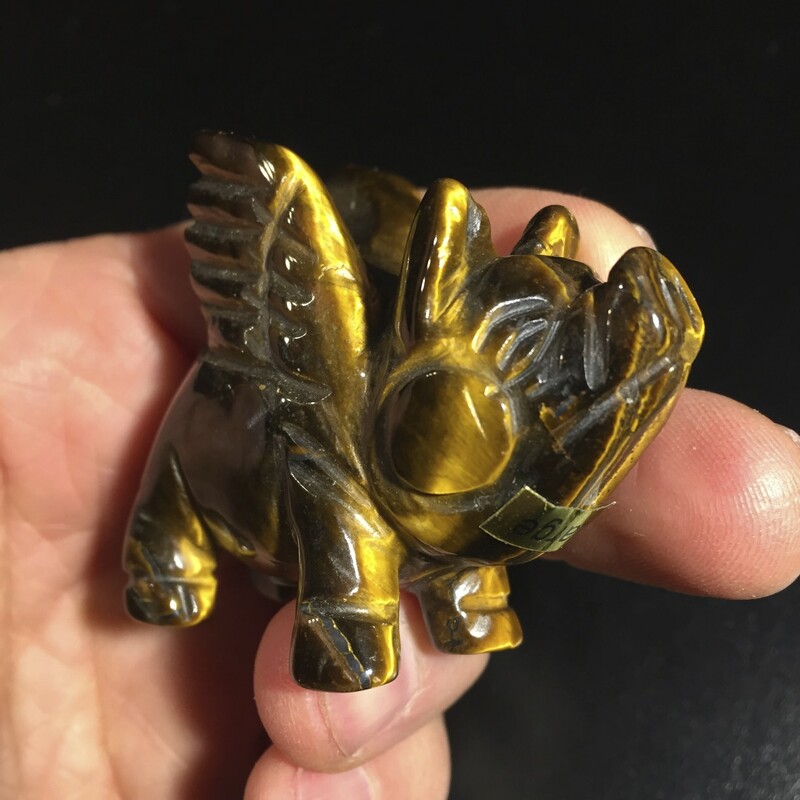 It presents well with a polished or matt finish, and is even shellac'd sometimes (which I don't care for, that tends to mask or cover up its energy flow). I specialize in Rhodochrosite - have a huge supply of exceptional specimens - and would be happy to send you some images, as we do mail order. Write me: Kyle@PortalCrystalGallery.com, or visit our storefront, all info at PortalCrystalGallery.com. We also have a few pieces up on our For Sale items site: www.PowerStoneCrystals.com. Everyone has a Rose Quartz - but do they really appreciate them(?) - I wonder, based on folks' seeming disinterest (that I've noticed) at shows. 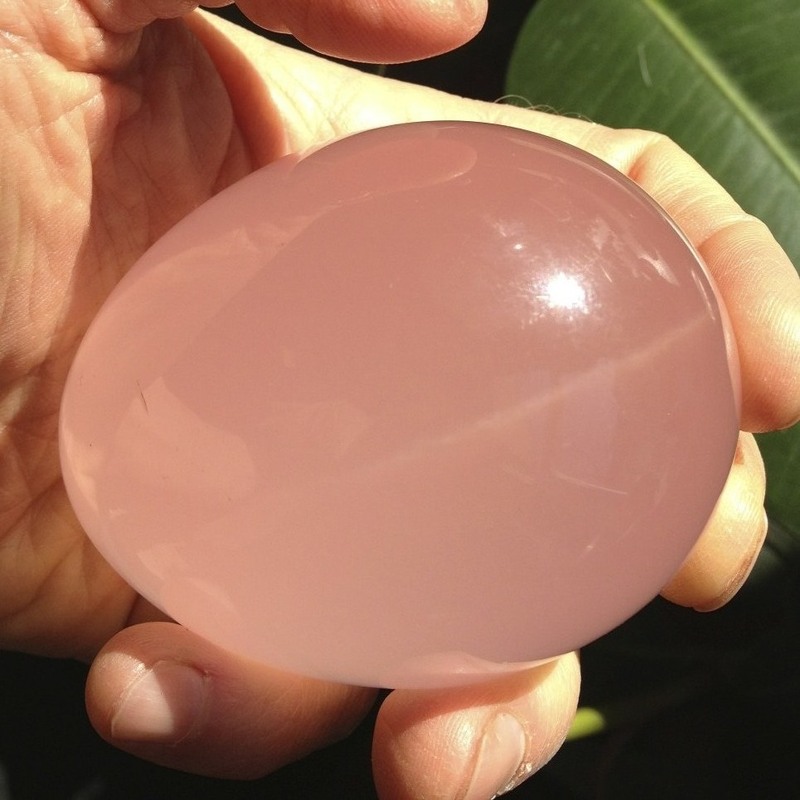 Although it primarily represents Unconditional Love, Rose Quartz is not a one-liner, and you should definitely branch out, to have some of the variations featured. Click through to learn more about each one's qualities (and awesomeness)! Ruby is the ultimate grounding stone. It is not metallic - it is 100% rock - and is paired with the Root Chakra (not just representing foundation, but fire, from a deep place of Life Force and energy). 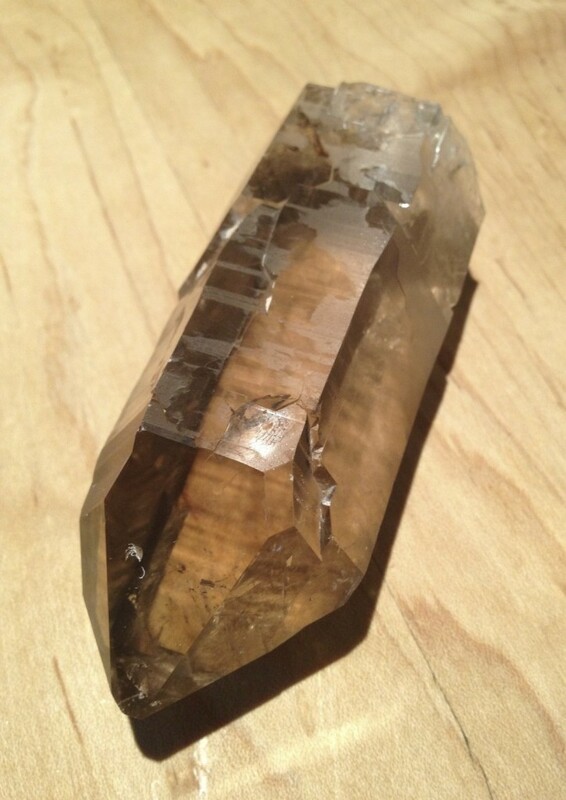 Smoky Quartz is one of my favorites (among many, of course). It is THE detoxifying stone, par excellence. Everyone's looking for - or selling - EMF (electro-magnetic-field, or "forces") protection. To me (from my own touch) - Smoky Quartz makes me feel much better after holding a cell phone - than any other gizmo offered me. It's color comes from irradiation in the ground - naturally - but the stone is not radioactive (which would make it poisonous, like Uranium). It has transmuted the toxicity of the radiation - neutralized it - and as such, I've made the leap (intuitively) to dub it "the Forgiveness Stone." Smoky Quartz is softer to the touch than clear Quartz. But these qualities I'm referring to come only with this particular hue (featured in this album) - the darker Smokies have their merits - but they are different in what they bring to the table. Much more could be said - and I certainly broach this in pertinent workshops and webinars - but for now (till amended)...this will have to do. 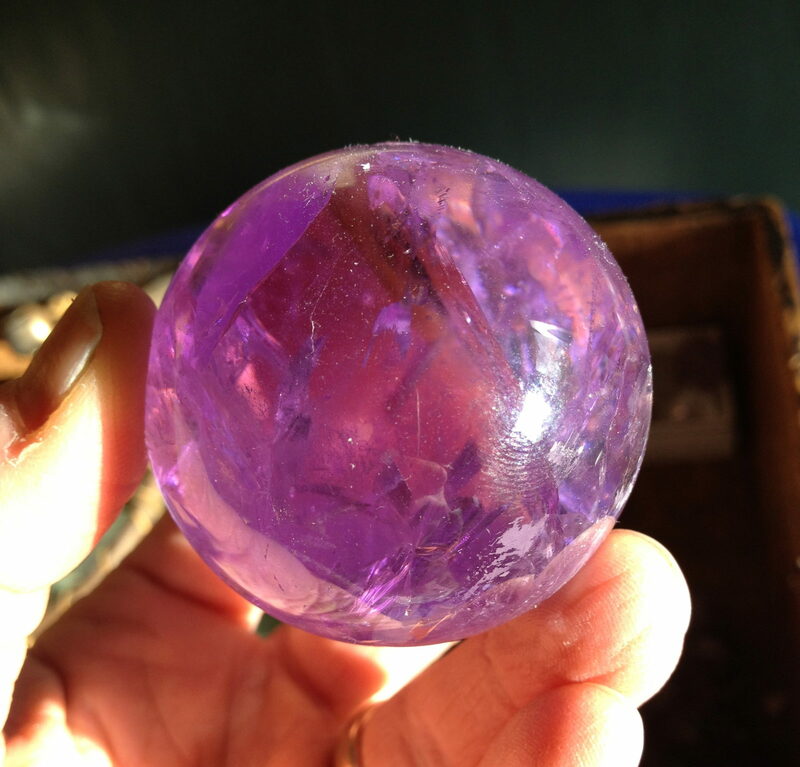 "The Manifestation Stone" - it is purple (having to do with Spiritual Mission) - but not translucent (meaning it has to do more with the tangible world). It brings the higher vision into being, or represents that process whereby the intangible is made real, or actualized. Tiger Eye is a yellow chatoyant stone, meaning it shimmers as you move it, in the light (or it give you "light play"). I used to think of it as "just a pretty face," an aesthetically pleasing stone, but not a Power Stone. I've learned differently, as I sat with it, and realized it's an important Solar Plexus, or Self stone. It is like a mirror - held up to reflect the Positive (or Best) Self - what you are (or should be) proud of. To purchase some Tiger Eye, or learn more about Crystals in general, join my mailing list by browsing my site and/or email Kyle@CrystalConcentrics.com. Topaz is one of the most naturally healing of Crystals. I've attributed it to Voice, because of how it "speaks" to the internal body - it is essentially "the water body" within - the nervous system at least (and more circulatory systems, potentially). When I hold it, cellular order and health seem to be restored instantly, like it's a reset button, to bring you back to your "original factory settings." Although it is a perfect conduit, even channel, for us to connect to our "lower body" (beneath the neck), I now must also include it in the Healing Energy Zone, because I think its healing qualities trump it's communication qualities (though both are relevant). Turquoise is its own entity - though partakes of the composition of Chrysocolla - and in this pure form, is like unadulterated innocence, personal purity, lightness of Being, self-forgiveness and gentleness. The most prized material comes from Arizona in the U.S. - but there are significant sources of it elsewhere - including mingled with other materials in Chrysocolla havens, like Peru. Turquoise is often "stabilized" - like it's shellacked - to keep it from crumbling, and is often sold as such, when in fact what many people sell as Turquoise is dyed (generally Howlite). The items here are pure, unless stated otherwise, be sure to read the individual descriptions. Email me: Kyle@CrytalConcentrics.com with questions, or to purchase some Turquoise, I specialize in custom mail order and would happy to find something wonderful for you! Not all Basalt is created equal - there's polished material - and of course the famous natural formations of it (I think Devil's Tower may be made of it). Anyhow, my personal favorite is the Ventifact - a name that comes from Latin, "Venti" being wind - and "Fact" meaning "made" (think "fait" or made, in French). Indeed these shards of igneous (magma or volcanic) rock - found near the South Pole, on the open steppes of Argentina - are shaped by wind and sand (or airborne particles). All of mine seem to be 3-sided, which is kind of unique in the stone world, and has meaning for those who believe in the Trinity of any sort (not just Christian). There is a 3-sided dagger of Spiritual significance in Tibet. And then of course, there is the pyramid, trigon, or Crystalline "record keeper." Ventifacts - as a result of having been polished by nature, comparable to river worn Jades - have a magnificent, soft and smooth surface. They are like a wand, but not a conduit for our energy. They are what I call "the black torch" - clearing (and oddly, lighting) the way before us - like Ganesha, the Indian elephant deity (who is associated with successful ventures). I always recommend Ventifacts for people looking for support in their movement and progress. Small pieces impart the energy directly to the hand, and are easier to store, and have around. The bigger pieces can "hold" a room, or be part of larger layouts or (as I call them) "constellations." One of my favorites, for sure.